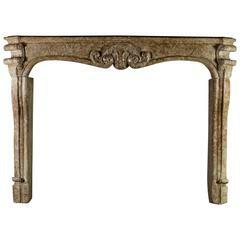 This is a very unique marble-hardstone original antique fireplace surround. The hardness of the stone reflects the light in the room. Only a few mantels were carved out of this kind of marble. All of the mantels in our inventory, in this particular marble-hardstone, are of an exceptional quality from the 18th century. Mantles like this were generally made by special order. The color and structure of the marble works even in a clinical contemporary interior. Measurements: 168 cm EW 66.14" 115 cm EH 45.28" 142.5 cm IW 56.10" 92 cm IH 36.22" 96.5 cm IH+ 37.99" 25 cm S 9.84". 18th century borgogna's stone fireplace mantel. Antique marble stone fireplace, 19th century. To place in front of the chimney. 18th century fireplace mantel made of Borgogna's stone. Very well recuperated and exclusive fireplace mantel out of a castle in France. 18th century fireplace mantel made of Carrara marble.